Already on the way out we were treated with some great views of the American Bald Eagle, the national bird of the USA. Almost extinct in the 1970’s due to intoxication with DDT herbicides (there were as few as 440 nesting pairs remaining in the lower 48 states), this marvelous bird is now recovering after DDT was banned, with more than ten thousand pairs as base for a healthy population. 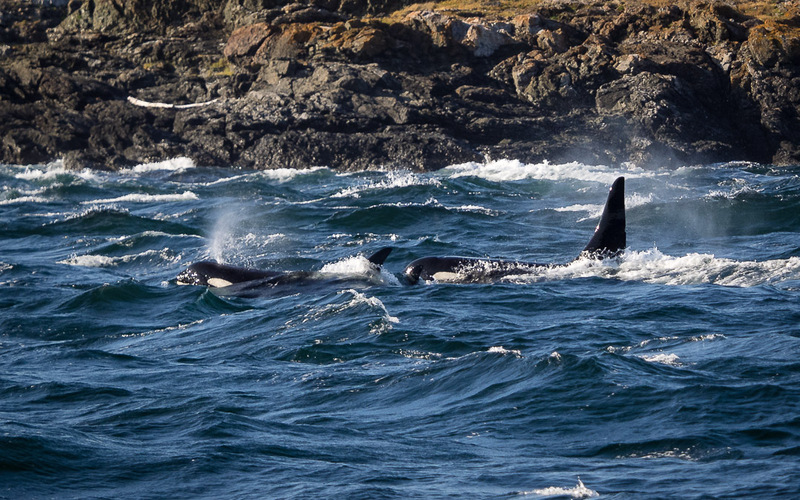 During my first cruise back a few weeks back we navigated through the inward islands before finding our Orcas out in Haro Strait. 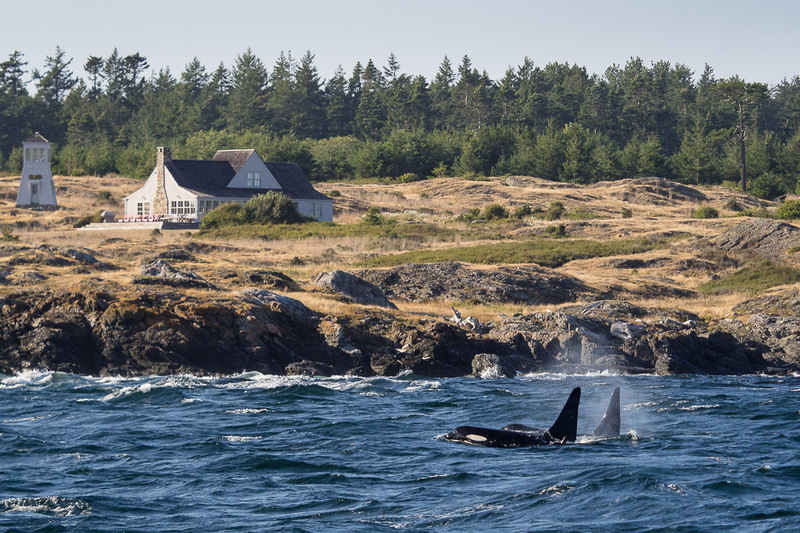 Today we navigated south of Lopez Island and San Juan Island into the Juan de Fuca Strait, where we found our whales on the south western corner of San Juan Island. With sleek black backs and bright white bellies and eye patches, orcas (a.k.a. killer whales) are easily distinguishable from other marine mammals. One of the ocean’s largest predators, male orcas can grow to 9.5 m (32 ft) in length, while females are slightly smaller at 8 m (23 ft). They live primarily where the water is cold but can live anywhere from the polar regions right up to the equator. This massive range makes orcas the most widespread of all sea creatures. 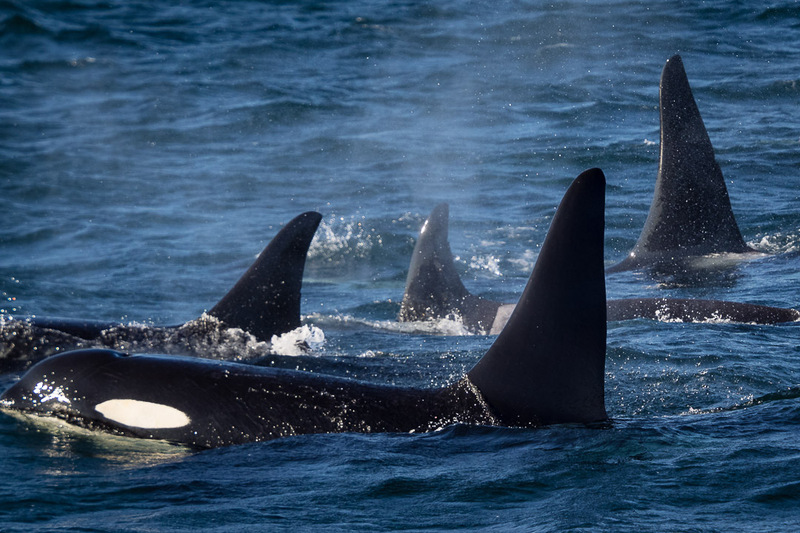 Orcas live and hunt in pods, or groups, in a way similar to wolves. They circle their prey and force them into smaller areas before attacking. Once cornered, the orcas take turns biting and ramming their prey. There are thought to be three types of pods: transient, resident, and offshore. Transient pods are constantly on the move following food sources. 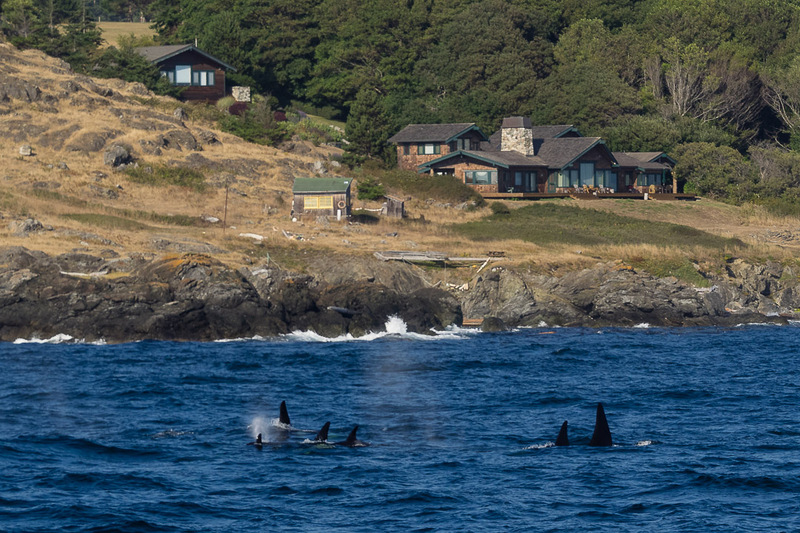 Resident pods generally stay in one area close to shore, while offshore orcas prefer the open waters. 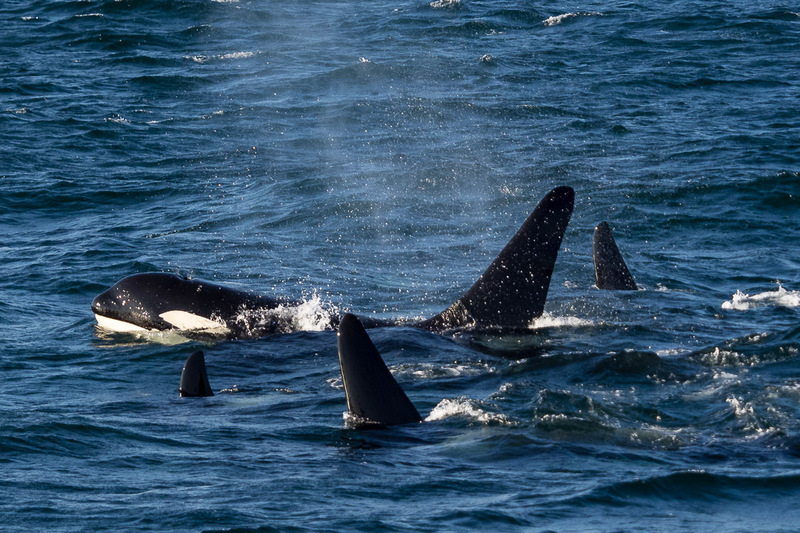 Our boat’s naturalist said, main behavioral difference is that resident Orcas feed mainly on fish (mainly salmon – a big male Orca eats 30-40 Salmon a day), while transient Orcas feed on other mammals. 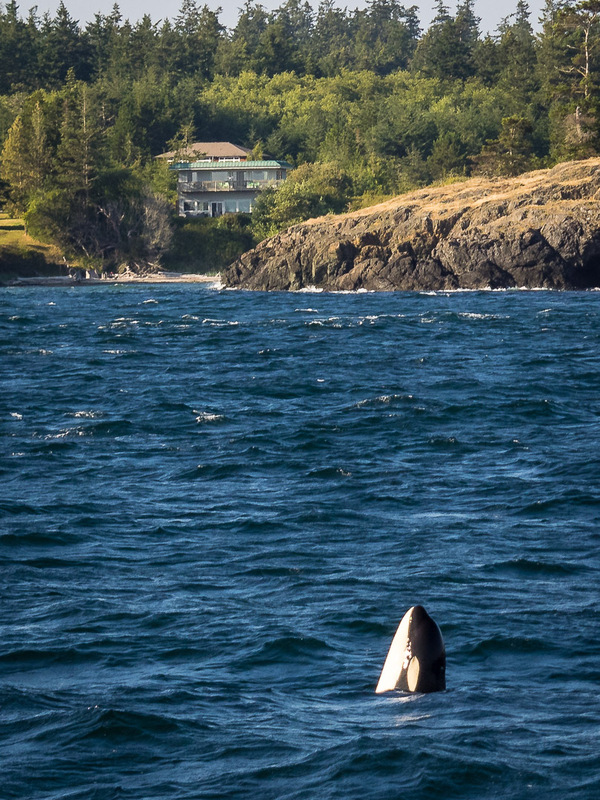 To our delight, this younger Orca was showing a behavior called spy hopping, an orcas’ way of checking out what is going on at the surface! Raising their rostrum up through the water, it allows the animal an elevated look at the world above the water. No doubt he was checking our boat. 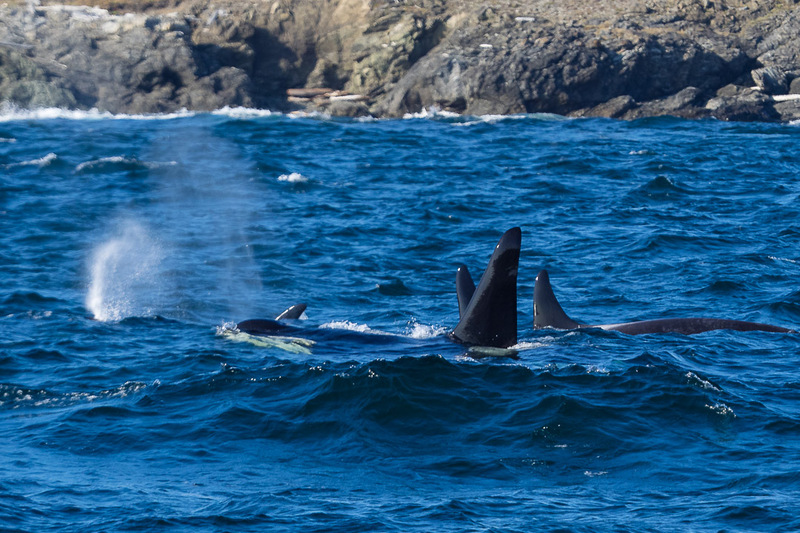 In resident pods, killer whales of both genders will live with their mothers for their entire lives, forming matrilines, so resident pods consist of very tight, stable bonds and can comprise of 10-50 whales. The pod we were watching was a sub-group of the L pod, consisting of 6 animals. As required, the whale watching boats did stay away from the Blackfish, so mostly they where quite some distance away from us exited viewers. And none of the whales attempted breaching the water, so no chance at getting any of those spectacular wildlife shots. But we were totally happy with this experience, and especially the family, as first time viewers, felt blessed to have had the opportunity to have seen these majestic animals in their natural habitat. As my kids stated, they made a lifetime memory this day. 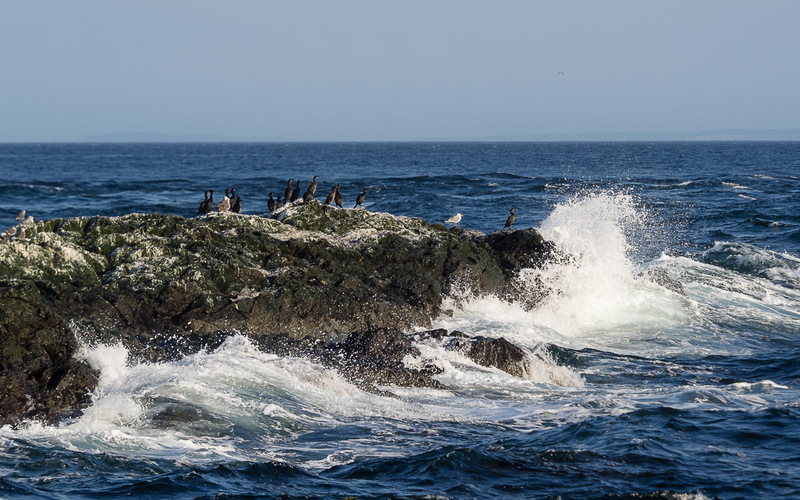 On the way back we passed Whale Rock, with Cormorants enjoying a break from fishing, and a big Steller Sea Lion in the swell, who was much to quick to be captured on camera while hunting for fish in the surf. We returned to the dock in Anacortes around 8:30pm after a great outing. Due to the haze in the air, coming from inland summer wild fires, we could only barely catch some views of the surrounding mountains on the Olympic Peninsula or the Northern Cascades with Mount Baker, like I did when visiting in the summer. But the day was truly a worthy start into our PNW adventure. All photos taken with the Olympus OM-D E-M1 with the mZuiko 40-150mm F/2.8 with the MC1.4 converter. Post-processing in Lightroom Classic CC. Wish you a great start into August! Amazing!! 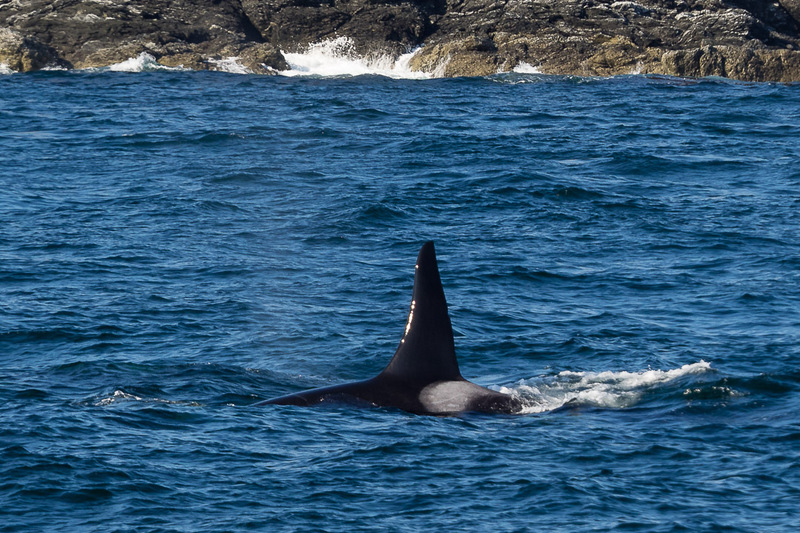 I have never seen Orca.. and from your pictures, it feels like you were really close to them! 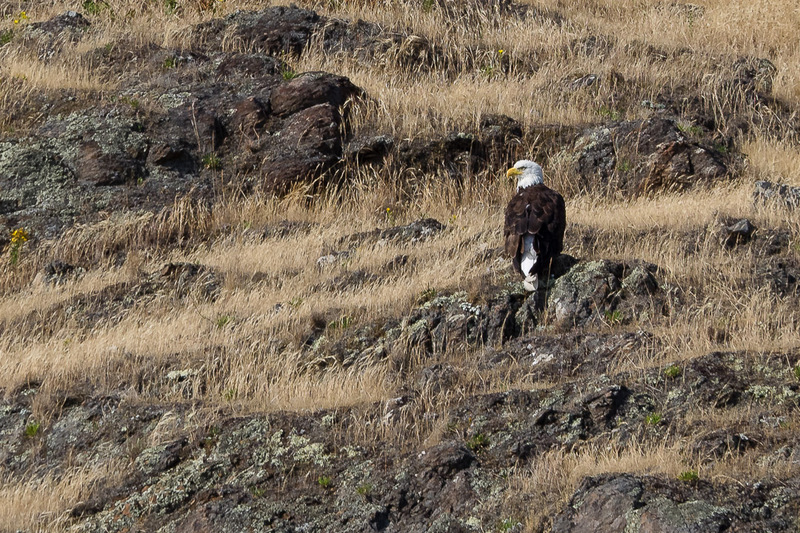 And seeing the American Bald Eagle in the wild too… I always wonder how big the bird in reality, your image of the Bald Eagle is stunning! Great photos Marcus, enjoy your family holiday! Great pix! I have very fond memories of a trip to Port Townsend a few years ago. An epic drive up to Hurricane Ridge in Olympic National Park. One of my favorite parts of the planet.